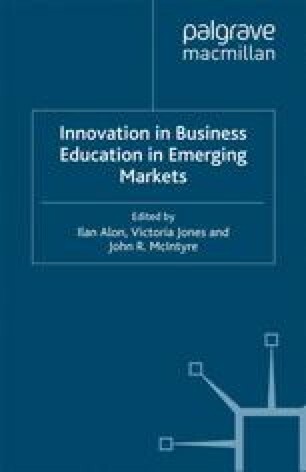 The three sections of this book have explored the interrelated themes of regional differences, adaptations to management education programs and developing trends that open new possibilities for management edu- cation in emerging markets. This chapter suggests a systematic evalua- tion and structuring of management education to ensure that programs are designed appropriately for emerging markets. Baby Bonanza, The (2009, August 27). http://www.economist.com/node/ 14302837. Brooks, D. (2012, May 3). “The Campus Tsunami”, The New York Times. http://www.nytimes.com/2012/05/04/opinion/brooks-the-campus-tsunami. html?smid=pl-share&_r=0.